Go on a camping holiday in the Provence Alpes Côte d’Azur region for fun times and a total change of scenery. The Yelloh! Village Luberon Parc, located near the Alpilles, Camargue and Marseille, invites you to spend your next holiday in the countryside, with the sea and mountains close by. The staff at the Luberon Parc will do everything to make your holiday relaxing and enjoyable. The campsite faces the Luberon Mountains, in an exceptional natural environment where the sun and the hum of the cicadas set the pace for your holiday! A 500m² aquatic park with fun water games area, waterslides, outdoor pool and a covered and heated pool. Extremely well maintained campsite and mobile home. beautiful swimming pool area. very friendly staff. 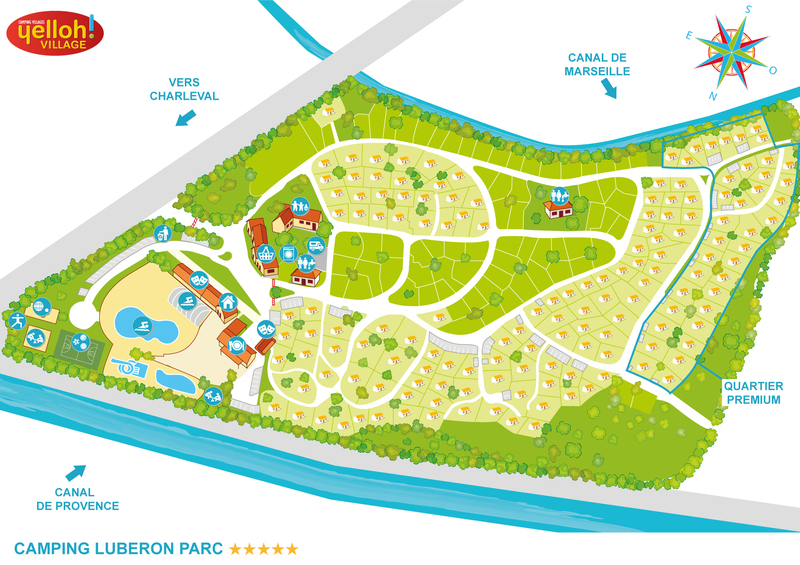 There is no doubt about it, your holiday at the Luberon Parc campsite will have a flavour of Provence. The sun, cicadas, Alpilles Mountains and pine forests are waiting to give you a sunny, laid-back holiday. The Luberon is the ideal region for those who love unspoiled nature: the Regional Nature Park of the Alpilles will enchant you with its distinctively southern mountain landscapes. Aix-en-Provence may look like a typical, small city in Provence, but it will surprise you with its old and contemporary architectural heritage. It's a wonderful city for walks. You may also visit the museum dedicated to Marseille's renowned soap as well as the Nostradamus Museum in Salon-de-Provence. This city also has many historical monuments such as the Empéri Castle, Saint-Michel Church and the Collegiate Church of Saint-Laurent. Head to the calanques, to the east of Marseille, for idyllic, relaxing moments with the family. You can swim in warm, crystal clear water in a picture postcard setting. You will fall in love with the camping at Aix-en-Provence with so many interesting things to see and do.